In September, the City of Maplewood, along with various other law enforcement agencies in Minnesota, submitted an application to the Commissioner of Administration requesting temporary classification of certain body camera recording system data (“body cam data”). Commissioner Massman acted on the request on September 28. Absent legal authority, the Commissioner could not grant the temporary classification request for data already classified as public or not public under current law. In considering classification questions about police body cam data, we hope IPAD’s guidance is a helpful resource. In the wake of McDonough v. Anoka County, et al., No. 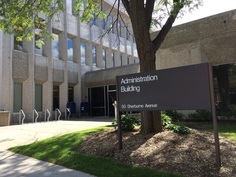 14-1754, et seq., (8th Cir., Aug. 20, 2015), Minnesota federal district courts have seen several rulings on motions regarding alleged violations of the Driver’s Privacy Protection Act (“DPPA”) stemming from alleged illegal use of the Department of Public Safety’s Driver and Vehicle Services database (“DVS Database”). In Meldahl, et al. v. City of Brooklyn Center, et al., No. 14-4465 (D. Minn., Sept. 30, 2015), the court dismissed all but two of the plaintiffs’ claims against a variety of law enforcement agencies, other municipalities, and the Department of Public Safety (“DPS”). The court dismissed several of the claims because they were barred by the applicable four-year statute of limitations affirmed in McDonough. The court also relied on McDonough to dismiss several claims on the basis that plaintiffs alleged insufficient facts to establish that their records had been accessed for an improper purpose. All claims against the Commissioner of DPS and various DPS officials were dismissed because such claims were materially similar to those previously rejected by the court in Gulsvig v. Mille Lacs Cnty, No. 13-1309 (D. Minn., Mar. 31, 2014). Finally, the court denied the remaining defendants’ motions that claims against them be severed pursuant to Federal Rule of Civil Procedure 20(a)(2), because the court was not yet in a position to determine if the remaining DPPA violations were independent or systematic. In Marquardt v. City of Blaine, et al., No. 14-2958 (D. Minn., Sept. 30, 2015), the court dismissed all but one of plaintiff’s DPPA claims because they were barred by the applicable statute of limitations or because the plaintiff failed to establish a pattern of access that could plausibly conclude her records had been accessed improperly. Claims against DPS were denied as they were materially similar to the claims dismissed in Gulsvig. In Karasov v. Caplan Law Firm, et al., No. 14-1503 (D. Minn., Oct. 23, 2015), all DPPA claims against defendants were dismissed on the basis that they were barred by the applicable statute of limitations. The Minnesota Film and TV Board asked whether it was subject to Minnesota's Open Meeting Law. The Commissioner opined that the Board is not subject to the law because it is not a State board, pursuant to Minnesota Statutes, section 13D.01, subd. 1(a). The Board was not created by the Legislature; it is a private corporation. Its members and staff are not appointed by the government and its meetings are governed by the Board’s bylaws.